In a small cup, dissolve the dry mustard in the water; set aside. In a medium bowl, whisk together the eggs, 1 cup of the evaporated milk, dry mustard mixture, salt, and pepper; set aside. Bring 2 quarts of water to a boil in a large Dutch oven. Add the pasta and 1½ teaspoons salt and cook, stirring often, until al dente. Drain the pasta and return to the pot over low heat. Add the butter and stir until completely melted. Add the egg mixture and three-quarters of the cheese mixture to the pasta and toss until thoroughly combined and the cheese starts to melt. 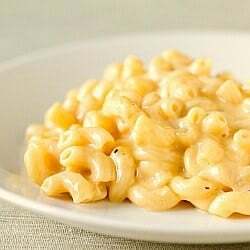 Gradually add the remaining evaporated milk and remaining cheese mixture, stirring constantly, until the mixture is hot and creamy, about 5 minutes. Serve immediately.